Al Young is an American poet, novelist, essayist, screenwriter, and professor. On May 15, 2005 he was named Poet Laureate of California by Governor Arnold Schwarzenegger. Young’s many books include novels, collections of poetry, essays, and memoirs. 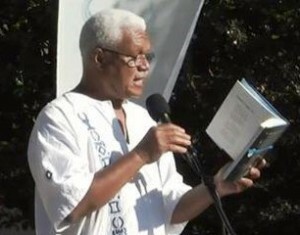 His work has appeared in literary journals and magazines including Paris Review, Ploughshares, Essence, The New York Times, Chicago Review, Seattle Review, Brilliant Corners: A Journal of Jazz & Literature, Chelsea, Rolling Stone, Gathering of the Tribes, and in anthologies including the Norton Anthology of African American Literature, and the Oxford Anthology of African American Literature. In the 1970s he wrote film scripts for producer Joseph Strick, Sidney Poitier, Bill Cosby, and Richard Pryor. In the 1980s and 90’s, as a cultural ambassador for the United States Information Agency, he traveled throughout South Asia, Egypt, Jordan, Israel and the Palestinian West Bank. In 2001 he traveled to the Persian Gulf to lecture on American and African American literature and culture in Kuwait and in Bahrain for the U.S. Department of State. Subsequent lecture tours took him to Southern Italy in 2004, and to Italy in 2005. His poetry and prose have been translated into Italian, Spanish, Swedish, Norwegian, Serbo-Croatian, Polish, Chinese, Japanese, Russian, German, Urdu, Korean, and other languages. Blending story, recitation and song, Young often performs with musicians. You bet it would’ve made a tender movie! journey that dulled every sense but touch. we talked what we felt, but never thought much. We were Romeo and Juliet night after night. unconsciousness. Maybe. Who knows for sure? enough to hold us aloft by heart and by ear.